Hello hello! As I mentioned in my 2013 Blog Round-Up, since the new year started, I've been stepping up my gym routine and eating a little more mindfully. 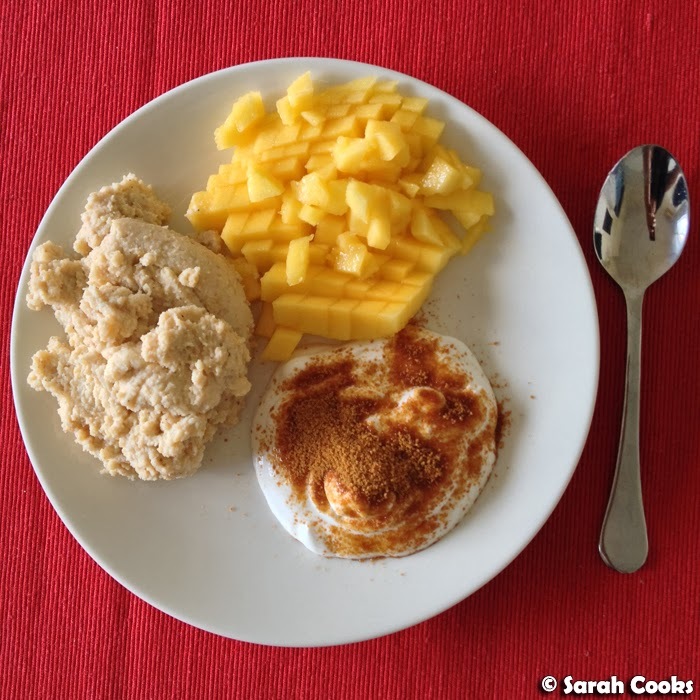 With that in mind, I'd like to share with you a recipe for coconut power pudding! 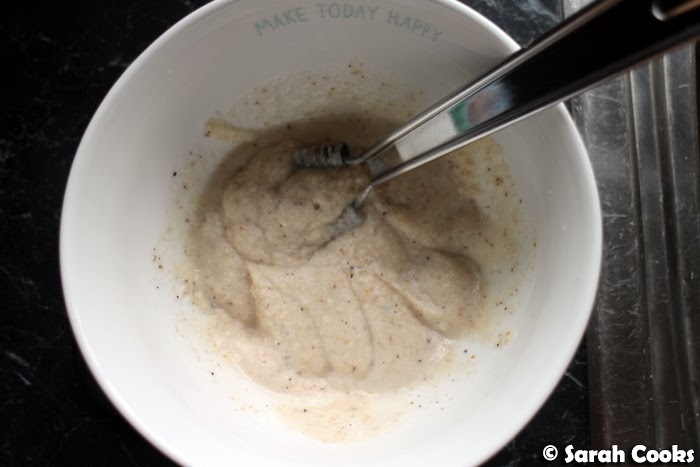 Ever since I discovered coconut flour on one of my extravagant spending sprees through the health food store - ridiculously high fibre, lower carbs - I've been using it to make banana bread, pancakes (recipe to be blogged soon), and this super quick power pudding. I found the recipe on the Niulife website, tweaked it a little, and now often make it for breakfast as it's fast, nourishing, and will keep me full for most of the morning. (In fact, it takes less time to make it than it does to explain it, haha). The power pudding is very easy to make - at its most basic, you just stir together coconut flour, a little coconut oil and a liquid (water, milk, whatever), let it thicken for a minute, and then eat it! I also add a teaspoon of coconut crunch, which is the dried flesh of a coconut after the coconut oil has been extracted, and was another health food store impulse buy. It gives a huge fibre boost to whatever you add it to. (It's expensive and I can't think of a lot of uses for it, so in my recipe below I've said it's completely optional and that you could substitute chia seeds or LSA mix or something similar). On this particular morning, I used "Coco Quench" coconut milk, which I found at my local supermarket the other day and just had to try. 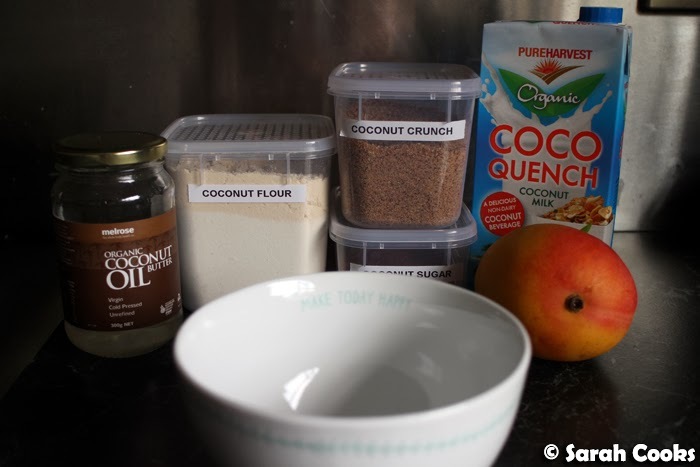 I'd seen smoothie and pancake recipes on health blogs that use coconut milk before, and wasn't quite sure what they meant, but I didn't think it was the normal tinned coconut milk that we use for curry and other south-east Asian dishes, which would be way too thick. I'm pretty sure they meant something like Coco Quench: "a "non-dairy coconut beverage". The Coco Quench is a mixture of coconut milk and rice milk, so you get the coconut flavour in a drinkable form. (It is 3.2% fat, so it sits between skim milk and full cream milk). Anyway, it's not a dealbreaker to use coconut beverage - so don't feel compelled to go out and buy it just to make this pudding - I always use what I happen to have in the fridge: water, dairy milk, soy milk, whatever. And that's it! Ready to eat. For those of you who haven't eaten coconut flour before, it can be a little heavy and "mealy", so I always have it with mango to provide moisture and contrast. You could use any fruit you like, but I love the tropical vibe I get from the coconut-mango combination. (Interestingly, coconut flour absorbs heaps of liquid and expands a lot, so a pudding made with just two tablespoons of coconut flour is a very satisfying breakfast for me). 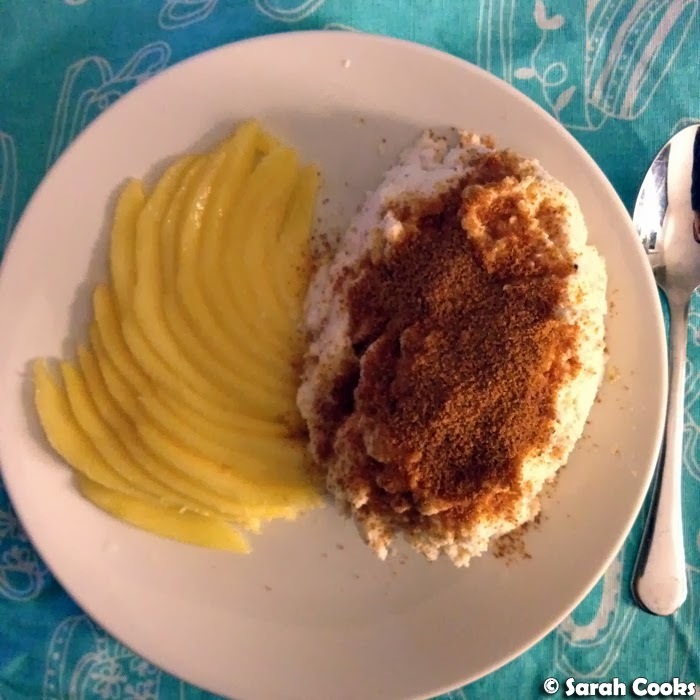 In the below two photos, I've added coconut sugar to my power pudding, but I actually find the pudding sweet enough with just mango, so I omit the sugar totally now. 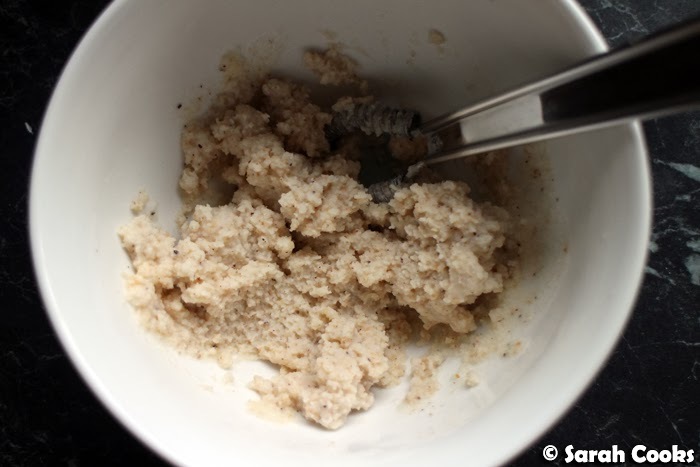 Melt the coconut oil in the microwave in a small bowl. Add the coconut flour, milk and coconut crunch, and whisk gently to combine. Allow to thicken for a minute. You're done! 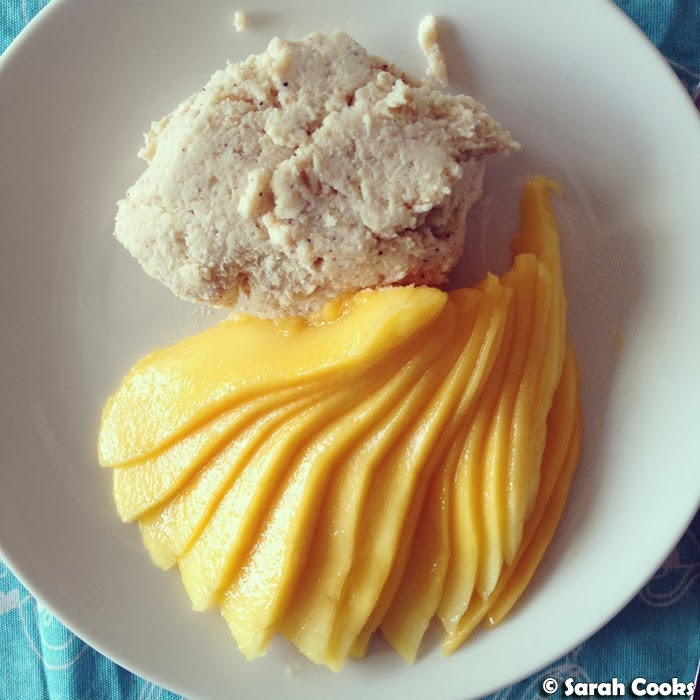 Serve with chopped mango or fruit of your choice, and sprinkle with coconut sugar if you need it. Sounds intriguing! I recently bought coconut flour and still deciding how I should use it. Will definitely give this a whirl! I must must must try this I saw it on instagram and was so intrigued :) Plus i bought some coconut flour a while ago so think it's a good time I used it! Sarah, I just tried this! Made it a lot runnier though. Used milk, coconut oil, coconut sugar. Topped with cocoa nibs and bee pollen.